QUEENS — About a dozen mom-and-pop businesses lined along the Long Island Rail Road bridge in the heart of Kew Gardens fear they may face demolition as the MTA tries to figure out what to do with the aging structure, local residents and officials said. The bridge on Lefferts Boulevard, between Austin and Grenfell streets, near the Kew Gardens LIRR station and the Kew Gardens Cinemas, is one of the most distinct spots in the neighborhood. Built more than nine decades ago, it's been compared by locals to the Ponte Vecchio, a medieval bridge in Florence known for shops built along it. But over the years the aging structure has become a hazard as falling bricks and pieces of crumbling facades continue to put residents and passing trains at risk, local merchants and officials said. Now, the MTA is considering not renewing the lease for the property operator when it expires in 2020, instead commissioning a developer to figure out what to do with the run-down structure, prompting concerns that new buildings could replace the 13 businesses currently located along the bridge, according to several people who participated in a meeting with MTA representatives which was held at Councilwoman Karen Koslowitz’s office earlier this month. 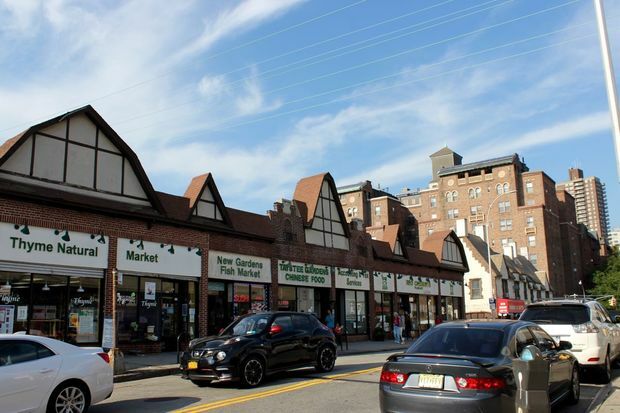 The bridge — which includes the roadway owned by the Department of Transportation and two LIRR-owned platforms supporting the rows of stores — also features a fish market, pharmacy, bagel shop and Chinese takeout. It’s unclear what specifically will happen to the structure in 2020. “Presumably, a developer would not replace the bridges unless he can have a development," said Murray Berger, executive chairman of the Kew Gardens Civic Association, who was at the meeting. “Changing it would severely affect the ambiance of the community,” he noted. He also said that about 25 years ago the MTA proposed putting up two high-rise buildings on Lefferts Boulevard but the agency eventually abandoned the project after it drew the ire of the local community. Business owners have been complaining for years that the property operator in charge of maintaining the stores on the bridge — Long Island-based Zee N Kay Management LLC — collects rents, but ignores their pleas to conduct basic repairs, including fixing a roof that has been leaking for years. "All buildings need maintenance, but they have done nothing to improve the structure of the bridge over the years," said Pradeep Agarawal, whose accounting office is located on the bridge. The license agreement between the LIRR and Zee N Kay, which was forwarded by a company representative, said that the company is responsible for all interior and exterior repairs to the buildings, except the underside, exterior rear walls, foundations and the support columns of the structure. Ultimately, locals said they blame the MTA for the disrepair. MTA spokesman Aaron Donovan said that the agency is “committed to working with the community to find the best possible outcome for this location," but did not provide further details. Local organizations and activists have created The Save Kew Gardens Coalition vowing to fight for the bridge and local businesses. They have also launched an online petition on Change.org which had more than 1,600 signatures as of Tuesday afternoon, five days after it was created. “The MTA/LIRR is using the results of their intentional neglect as the excuse for a revived attempt to destroy the heart of our community,” the petition reads. Residents and local elected officials are also pushing for an independent engineering company to assess the situation. “The decades-long neglect of the bridge shows how incompetent the MTA is at maintaining their properties and fulfilling their responsibilities as landlords,” said Deborah Emin, one of the concerned residents and a local publisher. Councilwoman Koslowitz said that she also is against the MTA "trying to get rid of those businesses." “Those stores are vital to the people who live in that community and we want the tenants that are there now to remain there,” she added. Koslowitz also said that neighborhood infrastructure cannot accommodate new buildings. “As long as I'm in the council that’s not happening,” she said.